Remember the joy of building your own log cabin with Lincoln Logs? 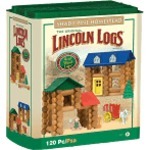 Enjoy those days again yourself or with your children with this set of Lincoln Logs. It's a complete set in its original box with instructions, and a new set goes for several hundred on Amazon. This is like new; the only reason it isn't new is that it's been opened. Bring the fun home!